Cape Town - Titans captain Farhaan Behardien says the CSA T20 Challenge is a wonderful opportunity for young players in their set-up to come to the fore and he is pleased so far by how they have done in the opening two games. The defending champions welcome the Dolphins to Willowmoore Park in Benoni on Friday, fresh from securing the first bonus-point victory of the competition when they beat the Cape Cobras at the same venue on Wednesday. The Titans are without several stars for this competition, offering opportunities to the likes of double-arm bowler Gregory Mahlokwane and Diego Rosier, who have both excelled thus far. "It is a challenge because some of our guys have gone overseas, some of them are playing in the IPL," Behardien said. "So, it is a chance for our young players to step up and so far they have. "It's a wonderful opportunity for them and they'll have more chances as the competition progresses." 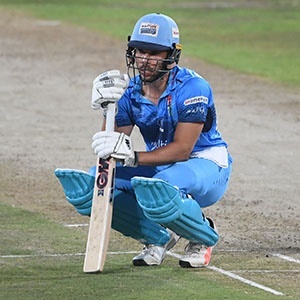 The Titans, who just over a week ago won the One-Day Cup, were unlucky to lose to the Warriors on DLS in the first game, but stormed back for a seven-wicket bonus point win in match two. "It was nice to get that first win out of the way," Behardien reflected. "It was disappointing not to finish the game the other night, but you can't control the weather. "Even though we lost that game, we always felt we were in a good space coming into the game against the Cobras. "We prepared well for the tournament and it was nice to beat the Cobras at home, especially with a bonus point. That extra point is as good as another win, so we're smiling about that." As for the Dolphins, they will be desperate to avenge losing to the Titans in the MODC final and also the final of the same competition last season. Behardien admits it will not be easy, adding: "It's going to be a tough one, but hopefully we can come away with a good result and enjoy a good weekend." The match is one of two on a busy weekend for all the teams. Veteran batsman Morne van Wyk knows the threat of the hosts better than anyone and is hoping they can get one over them on the East Rand. "It's a chance for us to regroup and bounce back immediately," he stated. "We'll hopefully take the positives out of the defeat to the Lions and look to hit back against the Titans. "They a team we always have had some good games against and I expect it to be no different on Friday." The Dolphins were beaten at home by the Lions in midweek, much to the disappointment of the wicketkeeper. "They never should have got above 150 and that's something we're working on," he said. "With the batting, we just couldn't get any partnerships going. "That’s just how it goes sometimes, but it's early days and we’re still searching for that right balance."